While it might have been extremely hot and wet at the Mayhem Festival, everyone still had a great time. I’m working through several thousand pics right now and will post them and any links as soon as I get them them online. Check back soon for lots of fun stuff. Multi-platinum Grammy winners KORN will premiere the video for their brand new single “Oildale (Leave Me Alone)” on MTV2 on May 31 at 6 AM ET. This marks the worldwide unveiling of the clip and coincides with the band’s week-long MTV Takeover, where they hosted both Headbanger’s Ball and Rock the Deuce. Korn’s new album, Korn III – Remember Who You Are, is due out July 13. It is the band’s first release for Roadrunner Records and is their ninth studio release. 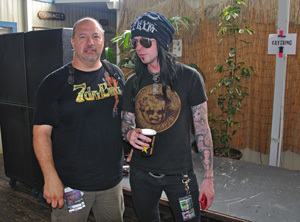 Korn III was produced by Ross Robinson, who manned the boards for the band’s first two albums, Korn and Life is Peachy.